There are 3 reviews of Spirited. I didn't get a Red Delicious Men quality from this one, unlike the other two reviewers. Instead, it's got a vegetal quality one finds in Egoiste Platinum, but that doesn't last long. There's some fruitiness, woodiness, and musk. I didn't get much in the way of spice, nor is there ever much tonka (and it's not sweet). However, after an hour or so the wood totally dominates, and it's quite dry. Overall, I don't think you can expect it to be more natural-smelling at these prices. And I think it would be great for layering purposes. So, I can certainly see why an aficionado might think this one is boring, but it has its uses for some of us, and if you want a cheap but decent dry wood scent (that lasts and isn't overloaded with obvious aroma chemicals) you might be surprised at how well this one fits the bill! The opening vaguely reminds me of DK’s Red Delicious except that I actually enjoy the top notes in this one, where I thought DK’s Red Delicious was horribly synthetic. The apple accord in Spirited is the dominant characteristic of the fragrance: a definite apple note… not screechy… tolerably synthetic… and the ginger adds a lot to the apple accord. The opening has perhaps the most sillage of the levels, and it also exhibits decent longevity. The heart notes are rather generic, but in a non-annoying way… I can’t differentiate the sage from the opening’s ginger and, as usual for me, I don’t smell the pepper. Also, I don’t really notice the sandalwood, but still, the middle accord is enjoyably mediocre. The base’s wood notes are quite synthetic, but in a non- annoying way. It grows sweeter as it goes along. It has fairly good lasting power, but its projection is below normal. 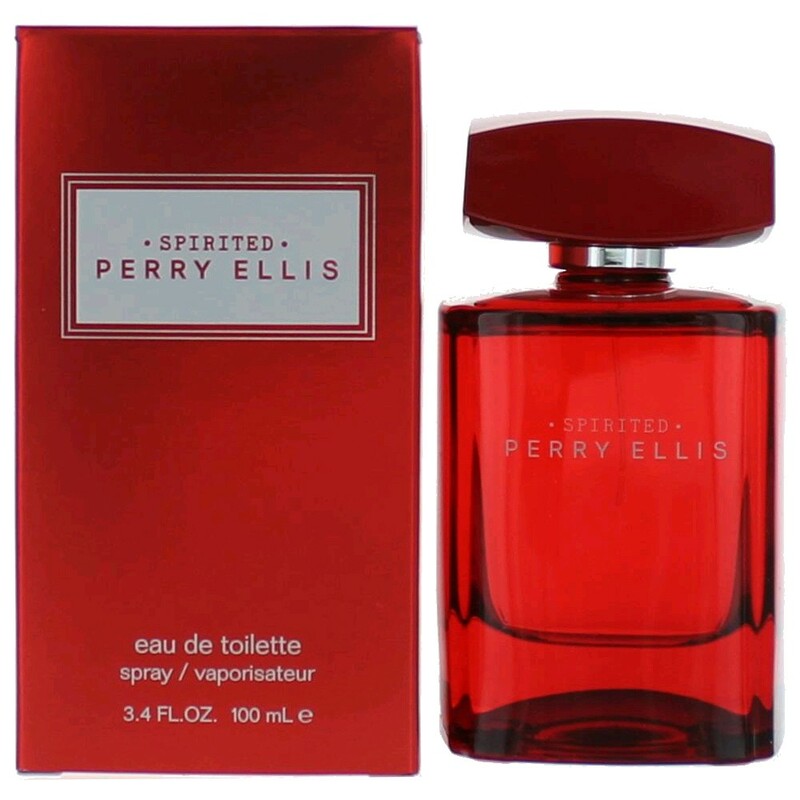 Spirited reminds me of many other Perry Ellis’ fragrances in that it is pleasant, uninspired, and competent. It’s meant for the younger crowd and, is an ok fragrance for its price. Pleased to be the first to review this completely mediocre fragrance. Let me start by saying I love the bottle, It's mostly red, sprayer works great. I got the 1.7 oz, and it's not a bulky awkward shaped bottle, it fits nicely in the hand and even better on the shelf. I paid about 11 bucks for my bottle on fragnet, it's a tester, brand new of course. Onto the scent.. This one really opens up like DKNY Red Delicious for men, a little more bland though, a little less of a juicy apple note. After a couple seconds I get some ginger, but not much. After about 10 minutes, I'm left with a very mediocre sandalwood/pink pepper combo, the same one that's been done to death in 20 other Perry Ellis men's fragrances. Very generic dry down, as I would expect from this brand. Usually Perry Ellis does pretty good top notes, that only last a few minutes, and boring dry downs. The quality of their stuff though is better than a lot of designers, but they seriously lack in longevity and projection, and Spirited is no exception. 4 hours tops with longevity. Which by the way, it becomes more sweet with the tonka bean later on (but very faint), projection is close to average, but slightly below. Conclusion.. if you can get a bottle for 10-15 bucks, it's a deal. If not don't bother. This a good scent to grab when you want something that's not entirely generic, because it is a little bit different, but you don't want your fragrance to last too long. Let's be honest, we love great longevity, but a lot of us love short lasting fragrances too, to fit the occasion. I have a couple in the 4 hour category, and this is one of them. There are no member images of Spirited yet. Why not be the first?